Riverfront, hot tub, fireplace and fire pit are just some of the amenities that Magic River Cabin has to offer. Experience privacy, serenity and romance at Magic River Cabin on the Shenandoah River in Luray / Page County, Virginia. 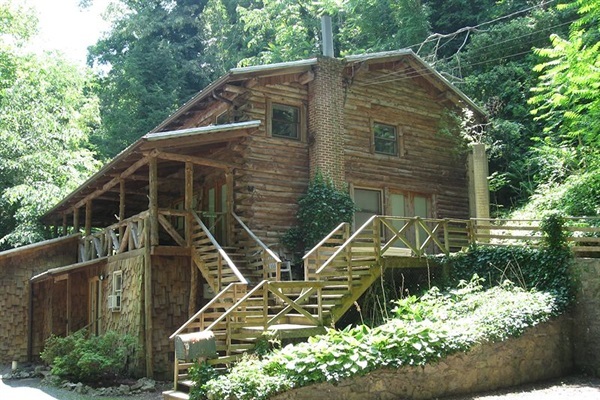 This Virginia cabin rental is perfect for honeymooners or anyone just needing to get away and enjoy peace and tranquility. Relax in the outdoor hot tub and watch the river go by, or sit and toast marshmallows at the riverside firepit. Magic River Cabin (lower suite) is a 2 bedroom (1 queen and 1 double), 2 bath cabin located on 10 secluded riverfront acres with 1200 feet direct riverfront access. The upper area is unoccupied.